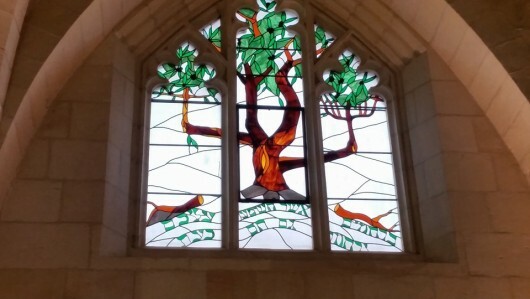 (Below) The Tree of Life window at Christ Church Jerusalem. We had a 2 hour worship service that felt like my soul was anointed with warm oil. Blessed and blessing. (Below) The weather in Jerusalem was horrific. It wasn't a blizzard--yet--but we expect snow tonight. I call this picture "Survivor: Jerusalem" Read the blog later for the story. 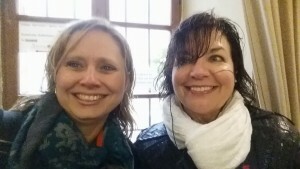 The woman in the picture with me is Dawn Batchelor, one of my bf's. Blessings to all. Today we spent the majority of the day on the West Bank, which wasn't a big deal, but we were in Palestinian territory, and it was clear to us. People look different and they sound different. We ate at a Palestinian Restaurant called Temptation Restaurant--just the name would tip you off that you were in a different place--neither Jews nor Christians would name their restaurant Temptation! Generally the Palestinians live in much less glamorous housing and our guide pointed out that they are always ready to be under siege and have built large water tanks on their homes so they have water for up to two weeks if they come under attack. While I would not call Israeli housing attractive--cinder block and concrete--Palestinian housing is much more worn looking, broken down, lower income, etc. I was also told tonight that a Palestinian girl was shot to death by an Israeli police officer on the West Bank, close to where we were, after she allegedly tried to stab him. I say 'allegedly' because it's hard to get the full story. Why would a 13 year old girl try to stab an armed soldier? I know I don't understand all of this, and the questions remain in my heart. We also went to the site where the ancient city of Jericho is being excavated, and after that to Qumran where the Dead Sea Scrolls were found. To be honest, I am officially overwhelmed by all this knowledge, what I am seeing, hearing, eating and experiencing, and today I am almost too tired to write this, but I want to keep touching bases to let you know a little bit about my trip. As I write this from the cozy room I have in the Christ Church guesthouse in Jerusalem, centrally located near everything, I can hear a cat meowing close by. One of the great surprises of this country is the many, many cats that wander all over. If I were a photographer I'd be publishing a calendar "Cats of the Holy Land" because they are at every restaurant, every street corner--one nearly stole the sandwich I was eating yesterday until I yanked it away from him, and he looked so offended! I'm also troubled. This is not a country where I would like to live. While the tour does a good job of bringing us to meaningful places--essential touch stones for our faith!--there so much difficulty, judgment, tension. I will bring those things with me to worship tomorrow morning at Christ Church, and I will pray my little prayers that God will bless these people, that he will somehow find the way to teach them ways of peace, and that they will someday choose that path. I know that I often talk about impossible prayers for peace, because peace seems impossible sometimes, but I believe that our prayers are the great gift we can offer on behalf of people who have primarily known lives of violence, and we know that all things are possible with Christ. And guess what? Jerusalem is expected snow on Monday and Tuesday, and while that is startling to people here, it's not for this New Yorker! I'll feel right at home! Tell Fr. Mark I said hello and thanks tomorrow morning, and as always, I will pray for you. 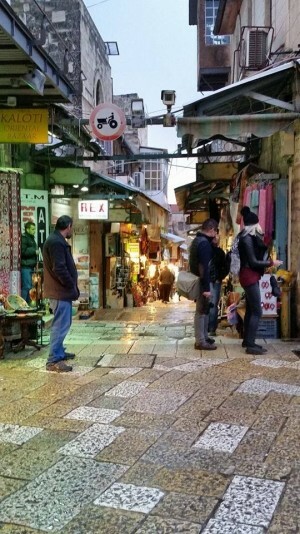 Our first moments in Jerusalem--street life as we walk to the guest house. I am so blessed to be here! 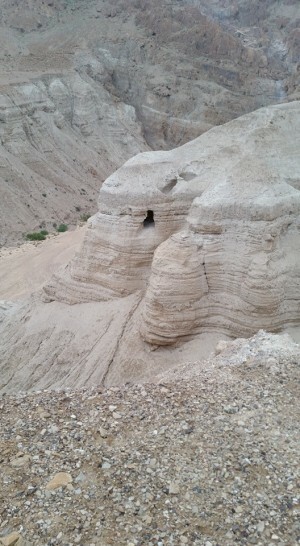 (Below) The caves at Qumran where the Dead Sea Scrolls were found. The instructions: " If the bus goes off the road, or the driver has a heart attack and the bus ends up on its side, DO NOT get out of the bus! Stay inside, no matter what, until Israeli police arrive to help." These are land mine warnings. On both sides of the road leading up to Mt. Hermon, the yellow triangles warned us about the land mines in the side is the road that were placed to deter Syrians from crossing the border into Israel. Mt. Hermon, covered in snow, is the place where the transfiguration is believed to have taken place. Were we ever really in danger? Absolutely not, as long as we obeyed the signs. When we got to our destination, a lookout point into Syria from the side of the mountain, it was sobering to look over the distance--200 yards?--and see the border with Syria just ahead of us. As my son said before I left, we hear about Syria and read about it every day, but I now stood close enough to see it, close enough to see people walking about. A UN compound marked the spot where the border began, and on this day, no gunfire, but we were warned that it was an active area. Most commonly, badly injured Syrians are passed across the wire to get better quality medical help from Israeli doctors. Once healed, the injured have to be driven back to the border at night where they are lowered over the boundary and have to head back to their homes to fully recuperate. It is nearly impossible, if not illegal, for a Syrian person to become an Israeli citizen because of the terrible history between the two countries. So as we stood at the bluff, looking over the places where a complicated history of violence runs deep in the blood on both sides, we stood together and prayed the impossible/possible prayers for peace, for protection, for healing. Holy ground. We also had fun today, though. One side trip was to visit the Olea Essence factory and store which is an olive pressing/processing facility. We tasted freshly pressed olive oils, learned that taking a reason of oil every morning will improve hair quality and digestive health and bathed our hands in an olive mash left over from the pressing that is now a patented cleanser. We were all touching each others' hands and exclaiming about a whole new level of softness! Let's just say the marketing strategy worked, ok? We also saw the oldest existing archway in the world at Tell Dan, an archway called the Abraham Arch because it is believed that he traveled to this community on his way to the Promised Land, and then again when he rescued his nephew Lot. It dates to 2000 BCE. It felt impossible to me. And then our final stop overlooking the Sea of Galilee on our last night's stay here. We stopped at a bluff where the demon came out of a man (the demon called Legion--see Luke 8:30) for they were many and they then rushed into a herd of pigs, who then down a hill and drowned. The site was formerly in Syria, but is now part of modern day Israel, so there were more land mine warnings all around. Much like Northern Ireland, this is a land torn by many forces, religious, economic and emotional. The Jewish people take seriously the belief that this is their promised land, but others who have settled there disagree. It is a complex topic not easily covered in a blog, so I won't try. This trip is far beyond my expectations, and it can be tough to absorb everything we are seeing. But I know this is only my FIRST trip. There will be more trips to explore the complexities, the beauty and the history. Israel is a harsh country, but I am drawn to spend more time here, and I pray you are already thinking and praying about coming with me the next time I go. And now I am aware that the great blizzard of 2016 is about to settle in over you--Snowmaggedon, which combines both your experience and mine (snow+ Armageddon). Weirdly enough, I will miss being with you as we dig out together, but you will be in our prayers over here for safety, for comfort and for the blessing of family time spent together while the blizzard rages outside. 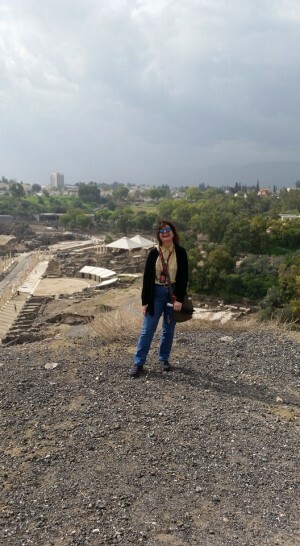 Standing at the top of the Tell where King Saul's head was displayed on a post after his death, overlooking the oldest theatre in Israel from the 4th Century. Many, many steps uphill! I earned my falafel today! 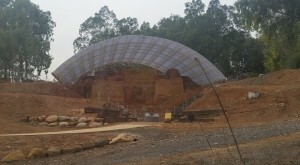 (below) Archaeological excavation of Abraham's gate. 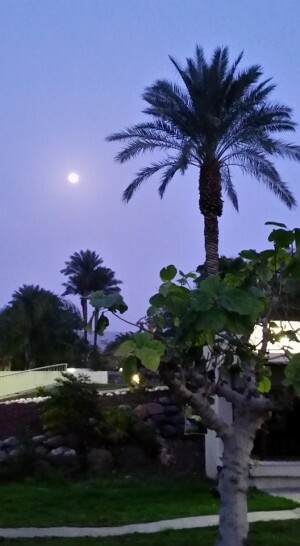 (below) Internet has been nonexistant, but here's one pic of our sunset over Galilee last night.